Found in pure stands since the settlement of the Coastal South, the southern yellow pines (Pinus spp).—loblolly, longleaf, slash, and shortleaf—have long been used for flooring and moulding in southern homes. So named for its light, faintly yellow appearance when unfinished, southern yellow pine is also noted for its pink to red heartwood and its sound knots in a character grade. It is durable but will show some trace of use in service from high heels or furniture movement. It fell out of use as an interior flooring product in the post-war South with the advent of central air and heat that caused excessive shrinkage of pine flooring from southern pine sawmills selling 14-16% moisture content products. At Carroll Hardwood, we buy green southern pine lumber and kiln-dry it to 7-9% moisture content, as we do with all our flooring products. Then it is side-matched and end-matched with the same care as our other hardwood flooring to achieve the superior performance in place expected of all NOFMA products. 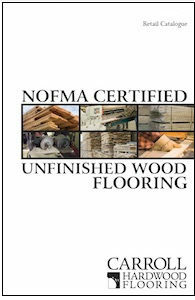 Please download our Retail Unfinished Flooring Catalogue from the tab on the right for our most recent pricing and grade descriptions. Select Pine is free from knots or wormhole and will present a relatively uniform light to cream color with the occasional flash of red heartwood in the floor. It is generally a plainsawn floor with few pieces of vertical grain flooring, unless otherwise specified. Select Southern Yellow Pine flooring is available in a Natural finish. Character pine is marked by the presence of relatively large, quite sound knots. There will also be gum pockets, pin worm holes, and occasional blue sap in this product. Excellent for an informal, rustic yet durable wood floor. 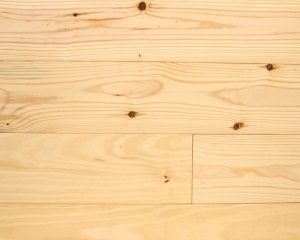 Character Southern Yellow Pine flooring is available in a Natural finish.